Location of Kuwait in the Middle East. The Sheikhdom of Kuwait (Arabic: مشيخة الكويت‎ Mshīkha al-Kuwayt) was a Sheikhdom which gained independence from the Emirate of Al Hasa in the year 1752. The Sheikhdom became a British protectorate between 1899 and 1961 after the Anglo-Kuwaiti agreement of 1899 was signed between Sheikh Mubarak Al Sabah and the British government in India due to severe threats to Kuwait's independence from the Ottoman Empire. Al-Hashemi-II Marine Museum in Kuwait City. Kuwait was founded in 1613 AD as a fishing village known as Grane. The region soon came under the rule of the Bani Khalid in 1670 after the expulsion of the Ottomans from Eastern Arabia by Barrack bin Ghurayr, Emir of the Bani Khalid who successfully besieged the Ottoman governor Umar Pasha who surrendered and gave up his rule as the fourth Ottoman governor of al-Hasa. The families of the Bani Utbah finally arrived in Kuwait in 1713 AD and settled after receiving permission from the Emir of al-Hasa Sa'dun bin Muhammad who ruled from 1691-1722 AD. The Utubs didn't immediately settle in Kuwait however, they roamed for half a century before finally settling. 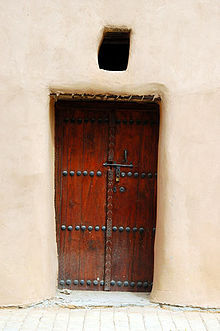 They first left the region of Najd in central Arabia and settled themselves in what is now Qatar, after a quarrel between them and some of the inhabitants of the region they departed and settled near Umm Qasr living as brigands, raiding passing caravans and levying taxes over the shipping of the Shatt al-Arab. Due to these practices, they were driven out of the area by the Ottoman Mutasallim of Basra and later lived in Sabiyya an area bordering the north of Kuwait Bay, until finally requesting permission from the Bani Khalid to settle in Kuwait which was then under the rule of the Emir of al-Hasa who himself was of the Bani Khalid. In 1752, Kuwait became independent after an agreement between the Sheikh of Kuwait and the Emir of Al Hasa in which Al Hasa recognized Sabah I bin Jaber's independent rule over Kuwait and in exchange Kuwait would not ally itself or support the enemies of Al Hasa or interfere in the internal affairs of Al Hasa in any way. In the eighteenth century, Kuwait prospered and rapidly became the principal commercial center for the transit of goods between India, Muscat, Baghdad and Arabia. By the mid 1700s, Kuwait had already established itself as the major trading route from the Persian Gulf to Aleppo. 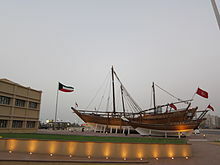 Kuwait was the center of boat building in the Gulf region in the nineteenth century until the early twentieth century. Ship vessels made in Kuwait carried the bulk of international trade between the trade ports of India, East Africa, and Red Sea. Boats made in Kuwait were capable of sailing up to China. Kuwaiti ship vessels were renowned throughout the Indian Ocean for quality and design. Kuwaitis also developed a reputation as the best sailors in the Persian Gulf. 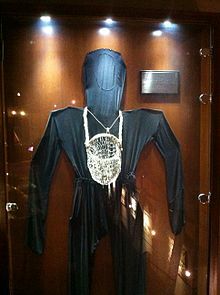 A piece of clothing used by Kuwaiti divers searching for pearls. In Al-Hashemi-II Marine Museum in Kuwait City. The Kuwait Red Fort in Al Jahra. The convention ruled that Shaikh Mubarak had independent authority over an area extending out to a radius of 80 km, from the capital. This region was marked by a red circle and included the islands of Auhah, Bubiyan, Failaka, Kubbar, Mashian, and Warba. A green circle designated an area extending out an additional 100 km, in radius, within which the qaimmaqam was authorized to collect tribute and taxes from the natives. Kuwait was recognized as a separate province from Iraq and given autonomy under Ottoman suzerainty in the draft Anglo-Ottoman Convention, however this was not signed before the outbreak of the first World War. The border was revisited by a memorandum sent by the British high commissioner for Iraq in 1923, which became the basis for Kuwait's northern border. In Iraq's 1932 application to the League of Nations it included information about its borders, including its border with Kuwait, where it accepted the boundary established in 1923. The discovery of oil in Kuwait, in 1938, revolutionized the sheikdom's economy and made it a valuable asset to Britain. In 1941 on the same day as the German invasion of the USSR (22 June) the British took total control over Iraq and Kuwait. (The British and Soviets would invade the neighboring Iran in September of that year). ^ "Encyclopedia of the Ottoman Empire". 2009. p. 321. ^ a b "Lord of Arabia" (PDF). H. C. Armstrong. 1905. pp. 18–19. This page was last modified on 9 August 2015, at 21:43.